You may or may not have known this, but I played tennis in a past life. Yep. All through junior high, high school, and it even paid some of the bills when I played in college. I haven’t played in years, but this marathon 11-hour match between Isner and Mahut caught my attention. Seriously? ELEVEN hours and five minutes? 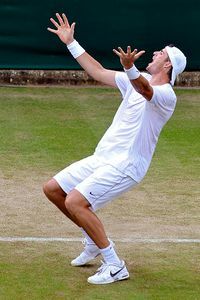 Isner had 112 aces. I think the highest until that was something like 78 . . .
I’m so inspired by tennis players–well, athletes in general. They all work so hard. The dedication and time spent on improving. The sacrifices made to be the best of the best. But after an eleven hour match, I would have said I needed a break from tennis like Isner did. Could you imagine how tired he was? No wonder he lost his next match, huh? Ever get worn out on something and need to take a break from it? This entry was posted in Exercise and tagged Amazing Stories, Catch the Rush, ESPN, Inspiration, Isner, Lynn Rush, Mahut, Marathon tennis match, Paranormal Romance, Tennis Matches by Lynn Rush. Bookmark the permalink. Doing anything for 11 hours straight would be a test of endurance and sanity! this tennis match was amazing! I admire them for not giving up. What a lesson in exerting your best even when you’re tired and have stepped outside the conventional restraints (i.e. tennis matches aren’t supposed to go that long.) I’m inspired by their persistence. I’m not a tennis fan (mostly because I was the person who could never serve to save her life in PE), but even I was impressed by this. I used to play a lot of pool. I mean A LOT. Nearly every day. Not for money or anything, but for fun. After about 2 years of constant playing, I stopped cold turkey. Now I play once in awhile, which means it’s fun again.